Remember I talked about losing those extra pounds? Well those turned into extra, extra pounds to lose, after last week’s trip out of town. Weekends and trips out of town just melt my resolve to exercise portion control and eat healthy. So I am doubly motivated to eat healthy this week. This paratha is a soft and luscious, ‘ meal in one’ that I urge you to try. It is a nutritious, satisfying, yummy and figure friendly meal. The leftovers taste fabulous for lunch the next day, so it is well worth the effort! Dal is a major source of protein in the vegetarian diet. I used masoor dal (red lentils) for this recipe for two reasons. It cooks quicker than other dals and it tastes delicious. I used fresh methi leaves, which are leaves of the fenugreek plant. Fenugreek is commonly used in Indian cooking because of its many health benefits, especially according to Ayurveda. Controlling glucose levels in our body, is one of them. In India, fresh methi leaves are one of the bitter greens that are cooked regularly in many households. Usually whole wheat flour alone is used for parathas, but I added besan(chick pea flour) for its flavor and to boost the protein content. We all know the health benefits of flax seeds, turmeric, garlic and onion. Hot chili peppers are said to help with metabolism. So it is a bunch of healthy ingredients coming together for one delectable paratha. 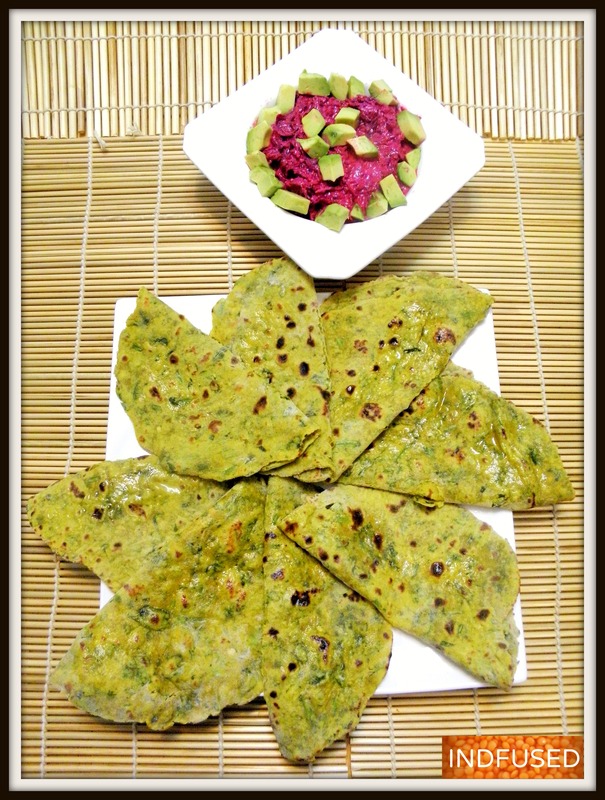 I simply served this Dal Methi Paratha with fresh beets and avocado raita and store bought sweet and tangy chunda pickle. The soft and luscious parathas have won us over and are sure to be on the regular menu in our house. 1 cup chopped methi leaves. I wash and spin the leaves in a salad spinner before chopping. all purpose flour for dusting/rolling. Cook the dal with the water, turmeric powder, garlic, onion, chili and salt. When the water comes to a boil, reduce heat and let the dal cook, covered, on low heat, about 12 to 14 minutes or until thoroughly cooked. Remove the chili pepper and let the dal cool. Blend it well with a whisk. Add the chopped methi leaves and brown sugar. Combine well and add the flours and the flax seed meal and knead the dough. I did not need any more liquid or flour to make the dough. Also the salt content was just right for us. But the flours and liquid content of dal may vary so adjust accordingly and also check for salt. 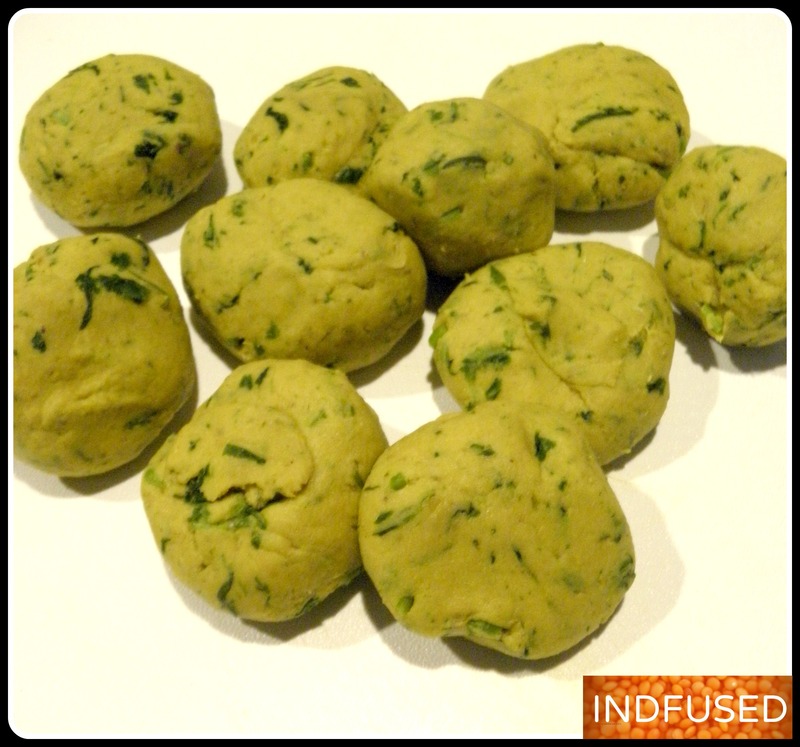 Set the dough aside for 25 to 30 minutes, so the flavors come together well and also the consistency of the dough is better for rolling. and roast on a griddle on medium high heat. Turn and roast on the other side until the paratha is cooked, about 1 to 2 minutes on each side. Serve with a raita like the beet and avocado raita , the festive corn raita, the piquant pineapple raita or the creamy cool onion raita. Hope you enjoy this ‘guilt free’ meal as much as I did! 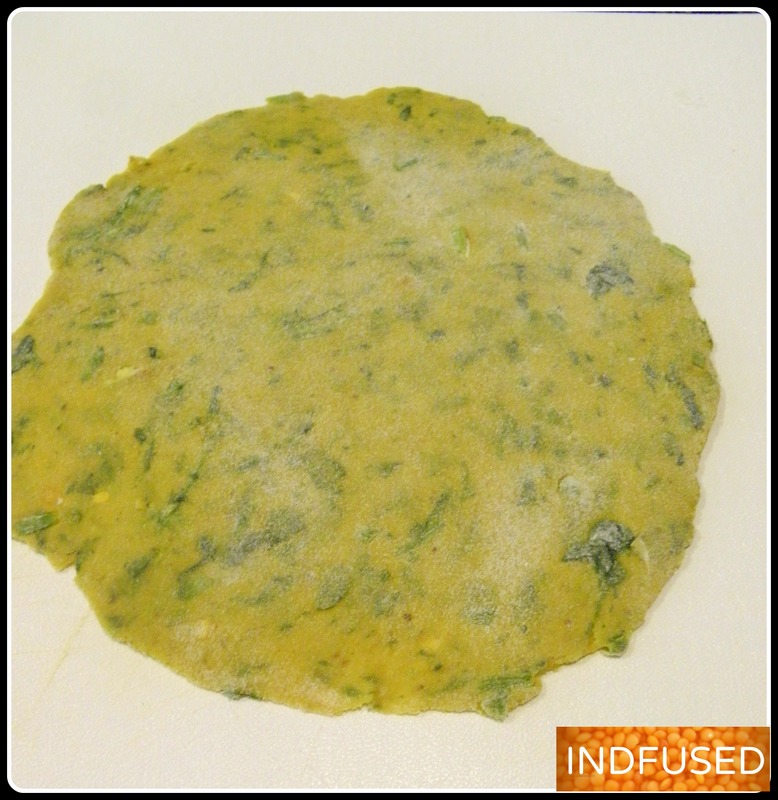 Great idea to add dal to Thepla/Methi Paratha, Sandhya. Ooh yums! Recently I used chapatis wrapped with button mushrooms and egg, topped with thick plum soy sauce and sprinkle some coriander and I was in heaven. Looks like this could go with egg and some mild curries! Thanks for sharing Sandhya! Yes it definitely will! We also had them with chicken curry. Thank you so much for your kind words. Your chappati wrap sounds delicious! Paratha’s my favorite Indian bread. Even better that it’s nutritious. I am not a huge bread person, but after experiencing the whole new world of breads in India, I am turned 😉 Thanks for sharing! Thanks so much Jin. Yes the dal in the dough itself, makes it so much more nutritious. Perfect combination of dal and vegetable.. Thanks so much Roopali! I like that they stay soft and pliable too, so I can use them as wraps the following day.